Size and proportion in harmony with body. Long and lean with a well defined stop. When viewed from the side, head planes (top of muzzle, top of skull and bottom of lower jaw) are parallel. Skull-oval when viewed from above, of medium width, without coarseness, and only slightly wider at the earset than at the brow. Moderately defined occipital protuberance. Length of skull from occiput to stop equal in length of muzzle. Muzzle- long and square when viewed from the side, of good depth with flews squared and fairly pendant. Width in harmony with width of skull and equal at nose and stop. Level from eyes to tip of nose. Nose-black or dark brown, fully pigmented. Nostrils wide apart and large. Foreface-skeletal structure under the eyes well chiseled with no suggestion of fullness. Cheeks present a smooth and clean-cut appearance. Teeth-close scissors bite preferred. Even bite acceptable. Eyes-dark brown, the darker the better. Bright, and spaced to give a mild and intelligent expression. Nearly round, fairly large, neither deepset nor protruding. Eyelid rims dark and fully pigmented. Lids fit tightly so that haw is not exposed. Ears-set well back and low, even with or below eye level. When relaxed carried close to the head. Of moderate length, slightly rounded at the ends, moderately thin leather, and covered with silky hair. Neck-long and graceful, muscular and lean. Arched at the crest and cleancut where it joins the head at the base of the skull. Larger and more muscular toward the shoulders, with the base of the neck flowing smoothly into the shoulders. Not too throaty. Topline-in motion or standing appears level or sloping slightly downward without sway or drop from withers to tail forming a graceful outline of medium length. Forechest-well developed, point of sternum projecting slightly in front of point of shoulder/upper arm joint. Chest-deep, but not so wide or round as to interfere with the action of the forelegs. Brisket deep enough to reach the level of the elbow. Ribs-long, springing gradually to the middle of the body, then tapering as they approach the end of the chest cavity. Back-straight and strong at its junction with loin. Loinstrong, moderate in length, slightly arched. Tuck up moderate. Hips-croup nearly flat. Hip bones wide apart, hips rounded and blending smoothly into hind legs. Tail-a smooth continuation of the topline. Tapering to a fine point with only sufficient length to reach the hock joint or slightly less. Carried straight and level with the back. Feathering straight and silky, hanging loosely in a fringe. Shoulder-shoulder blade well laid back. Upper arm equal in length to and forming a nearly right angle with the shoulder blade. Shoulders fairly close together at the tips. Shoulder blades lie flat and meld smoothly with contours of body. Forelegs- from front or side, forelegs straight and parallel. Elbows have no tendency to turn in or out when standing or gaiting. Arm flat and muscular. Bone substantial but not coarse and muscles hard and devoid of flabbiness. Pasterns-short, strong and nearly round with the slope deviating very slightly forward from the perpendicular. Feet-face directly forward. Toes closely set, strong and well arched. Pads well developed and tough. Dewclaws may be removed. Wide, muscular thighs and well developed lower thighs. Pelvis equal in length to and forming a nearly right angle with upper thigh. In balance with forequarter assembly. Stifle well bent and strong. Lower thigh only slightly longer than upper thigh. Hock joint well bent and strong. Rear pastern short, strong, nearly round and perpendicular to the ground. Hind legs, when seen from the rear, straight and parallel to each other. Hock joints have no tendency to turn in or out when standing or gaiting. Coat: Flat without curl or wooliness. Feathering on ears, chest, abdomen, underside of thighs, back of all legs and on the tail of good length but not so excessive as to hide true lines and movement or to affect the dog's appearance or function as a sporting dog. Markings-white ground color with intermingling of darker hairs resulting in belton markings varying in degree from clear distinct flecking to roan shading, but flecked all over preferred. Head and ear patches acceptable, heavy patches of color on the body undesirable. Color-orange belton, blue belton (white with black markings), tricolor (blue belton with tan on muzzle, over the eyes and on the legs), lemon belton, liver belton. Click Here to Learn about breeder background checks on English Setter breeders if you are looking for English Setter puppies for sale. Click Here to learn how ResearchBreeder.com can help you find healthy English Setter puppies for sale. Click Here to order a Breeder or Kennel Background Check on English Setter Breeders that may have English Setter puppies for sale. 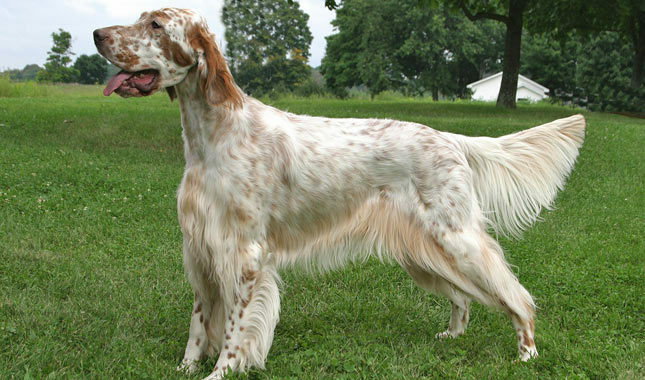 Click here to find the national breed club for English Setter puppies for sale. Click Here to purchase a list of approved ResearchBreeder.com English Setter Breeders who have English Setter puppies for sale.